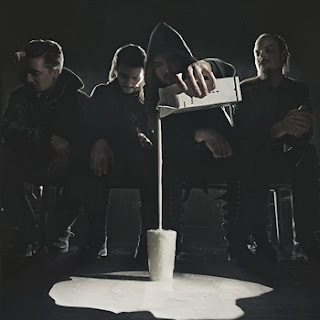 I may be a little slow to hearing Finland's BEASTMILK, but I'm glad I stumbled upon it just this very morning. After last week's journey into the realm of prog glory and instrumental dominance, I felt like I needed a little more dirty rock n' roll and darkness in my life. With a new album on the horizon, I thought I would jump into the band's offering from last year, a four-song EP full of moody tones and stripped down, fuzzy guitars. A short and sweet offering, Use Your Deluge is the musical equivalent to a gray, dreary morning with no chance of sunlight; a garage punk record that sounds as raw as the emotion that is the driving force behind the effort. From front to back, the album is a compilation of fast-paced and cryptic tracks that echo the darker side of early stoner rock and new wave. Simple drumming and shoe-gazing melodies set the tone early and provide an immediate taste of what the listener can expect throughout. Never venturing too far past the 3- to 4-minute mark, each track is quick to present its catch and memorable riffs, making the entire album seamless and polished. "Void Mother" and "Children Of The Atom Bomb" sound akin to a Joy Division/Blue Oyster Cult love child emerging from the blackest of caves, hitting hard where necessary, but letting the garage sound dominate for a majority of each song. On the back half, "Forever Animal" and "Red Majesty" slow down the pace, allowing for a more epic sound that feels extremely huge in the small space its given on the tail end of the album. The vocals are an element that immediately catches the ear, nearly monotone in parts, but shadowed by perfectly harmonized backing vocals. Singer Kvohst, an immensely captivating frontman given his recognizable croon and sultry tone, makes the album sound flawless in terms of direction. Seeming to know exactly what to say and how to say it serves as one of the strongest attributes for BEASTMILK. BEASTMILK'S full-length debut, Climax, will see an international release November 29 on both Svart Records and Magic Bullet Records. A new track from the album, "Fear Your Mind," can be heard here. Finally, for any readers we may have in Finland, BEASTMILK will play their record release show in Helsinki on December 5 with tickets available here.